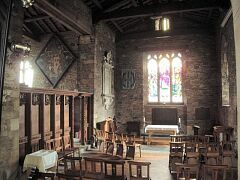 The church has an early C13th tower, C13th chancel and C14th aisles. 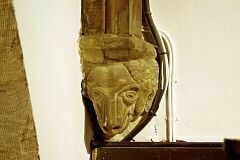 A watching brief during installation of a new drainage system in 1999 recorded the plinth foundations of a buttress supporting the north wall of the C15th chancel. Parish Church. C13 west tower and spire. C15 nave with clerestory and aisles, and chancel, C19 north porch and south vestry, 1935. 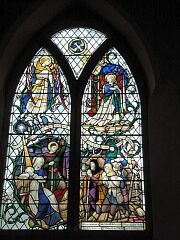 South transept with vestry by Albert Herbert. C19 and C20 restorations. Of Charnwood granite rubble with ashlar dressings and Swithland slate roofs. 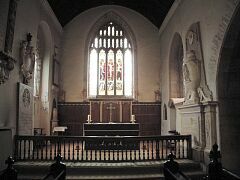 Perpendicular tracery to nave and chancel. 3-stage west tower lit by lancets, with angles clasped by buttresses. 2-light bell chamber openings. 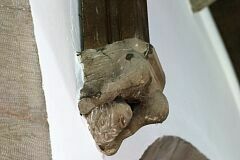 Broach spire has 2-light lucarnes with Y-tracery. 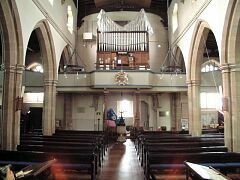 3 bay nave has cruciform piers on tall bases. 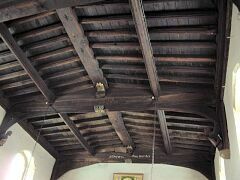 Roof dated 1636 and 1652 and renovated 1912. 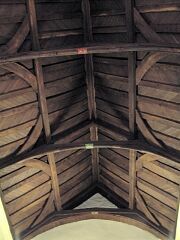 North aisle roof replaced 1952. 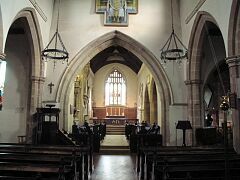 Pointed chancel arch with 2 continuously chamfered orders. Chancel roof 1880. 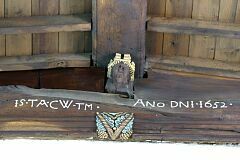 Medieval benches with heads and poppy heads on the ends. 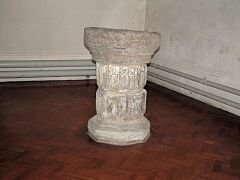 C14 font. Piscina in south aisle. Pulpit by R. Norman Shaw (Andrew Saint, 'Richard Norman Shaw', p298). 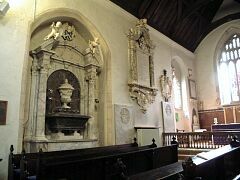 Chancel has piscina, C18 communion rail and a series of very fine monuments to the Phillips family of Garendon. 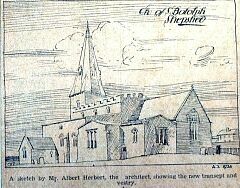 (N. Pevsner, 'Leicestershire and Rutland' p227; Harold mack, 'Shepshed Parish Church'). Many finely carved Swithland slate headstones in the churchyard. 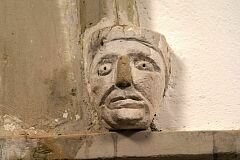 Project Gargoyle survey work in 2009 recorded a set of medieval (probably C13th) corbels in the nave. Most are caricature portraits. One is a sheep's head - clearly inspired by the place-name - and another is a contortionist with head between knees and 'mooning'. 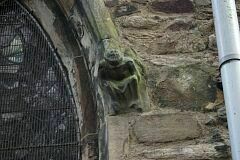 Several other examples of such contortionists in the east midlands (e.g. 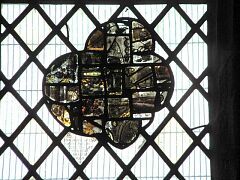 Tilton, Oakham, Colsterworth) are clearly male; others are ambiguous (e.g. Thorpe Arnold, Stoke Golding) but this one is seemingly a unique example of a female 'exhibitionist' in this pose. However it may be that this was originally male but was 'bowdlerised' in the C19th. 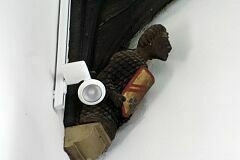 There are two wooden figures holding painted shields (and possibly wear chain mail) on plain stone corbels in west end of chancel. Probably C19th. 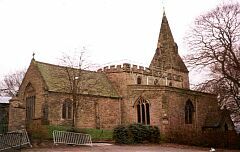 Wells, J & Warren, S, 1996, The Church of St. Botolph, Shepshed, Leicestershire: An archaeological evaluation (Unpublished document). SLE2632. 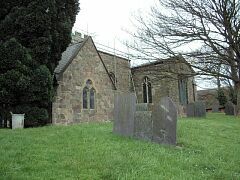 Higgins, T, 1999, An archaeological watching brief at The Church of St. Botolph, Shepshed, Leicestershire (Unpublished document). SLE2631. --- Unpublished document: Higgins, T. 1999. 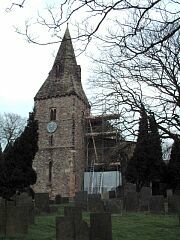 An archaeological watching brief at The Church of St. Botolph, Shepshed, Leicestershire. --- Unpublished document: Wells, J & Warren, S. 1996. 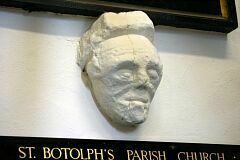 The Church of St. Botolph, Shepshed, Leicestershire: An archaeological evaluation.